Trips become all the more pleasurable if one is able to get a good hotel booking at a steep discounted rate. 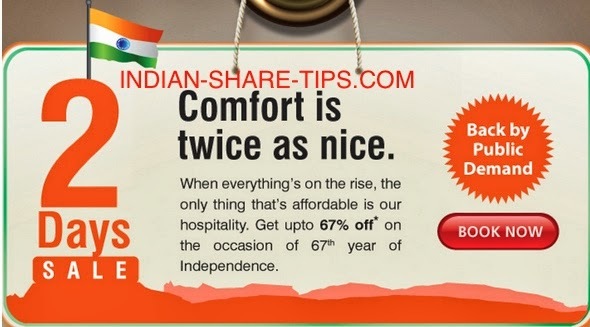 Check out Independence day special discount offer given by Ginger hotel. INDEPENDENCE DAY – 2 DAY EXCITING OFFER!! The above rate is on room only basis and taxes will be charged extra. The above rates will be Non-Cancellable/Non Amendable/ Non Refundable for the entire length of stay. No other offer or discount can be clubbed together with the above sale. No Coupon or Voucher can be redeemed on the SALE Rate. All other standard terms & Condition remains same. Not more than 5 Rooms can be booked for each guest. The rate will not be applicable at Ginger Delhi RYN. The above Rate can be changed or removed completely without prior intimation.